Aotearoa (ow-teeah-rowah) ... land of the long white cloud ... the Māori name for New Zealand. When I tell people who have never been to New Zealand that we’ve visited, the first response I receive is always “It’s on my bucket list” and justifiably so. We were fortunate enough to have spent over a year there sailing, exploring and enjoying the country and its people. We traveled the North Island, South Island, Fiordland, Stewart Island, the Chathams and lots of places inland and in between. In a word, New Zealand is awesome! To take up where we left off … in addition to our mainsail issues, we experienced significant engine problems on our way from Tonga to New Zealand, so it was a relief to finally tie up to the Q-dock (quarantine) in Opua, the first port of entry on New Zealand’s North Island. It was finally the time and the place to handle Cups’ multitude of problems … a not-so-subtle reminder that “cruising is fixing your boat in exotic places”. Lots of work was accomplished in Opua including replacing the engine; unstepping, painting and rewiring the mast; repairing the decks; replacing sails. The list seemed endless and the budget suffered, but when all was finished, Nine of Cups was seaworthy and in fine fiddle once again. Q-dock in Opua, New Zealand ... waiting for customs/immigration officials to check us in. The work was not completed all at once, but rather in stages which allowed us to sail a bit at a time and reconnoitre. Locally, the Bay of Islands is one of the premiere sailing grounds of northern New Zealand, so short trips exploring the islands broke up the tedium of boat work. David & Ian remove old engine from Cups. We drive old engine to Auckland. Slowly roll new engine down the dock and back to Cups. Yikes! The Bay of Islands provided excellent cruising grounds locally. Hiking on Urupukapuka was a wonderful break from boat work. Year 1 was spent primarily in the north both on land and sea. With our penchant for sailing around things, we circumnavigated the North Island over the course of several months, touching the north coast of the South Island and decidedly longing for more. Highlights included: sailing around Cape Reinga at the northern tip of the North Island, a stop in New Plymouth on the west coast, a couple weeks in lovely Nelson on the South Island spending time with friends and enjoying Abel Tasman National Park and checking out the nooks and crannies in Queen Charlotte Sound just off Cook’s Strait. We visited Cape Reinga by land first, then sailed around it on our way south. Pukepura Park, New Plymouth with Mt. Taranaki in the background. Trafalgar Street in downtown Nelson. Long-time friend, Peter, joined us in Nelson for some touring and exploring in the area. Early morning mist in an isolated, protected anchorage off D'Urville Island in the Marlborough Sounds. While stopped in Picton, we rented a car and drove to Christchurch to get our anchor chain re-galvanized and enjoyed visiting Aoraki/Mount Cook National Park while while waiting for the work to be done. Many of our ports of call had been called upon by Captain Cook and markers celebrated his historic visits. Aoraki / Mount Cook National Park was outstanding! Christchurch Cathedral before it was severely damaged in the earthquake of February 2011. 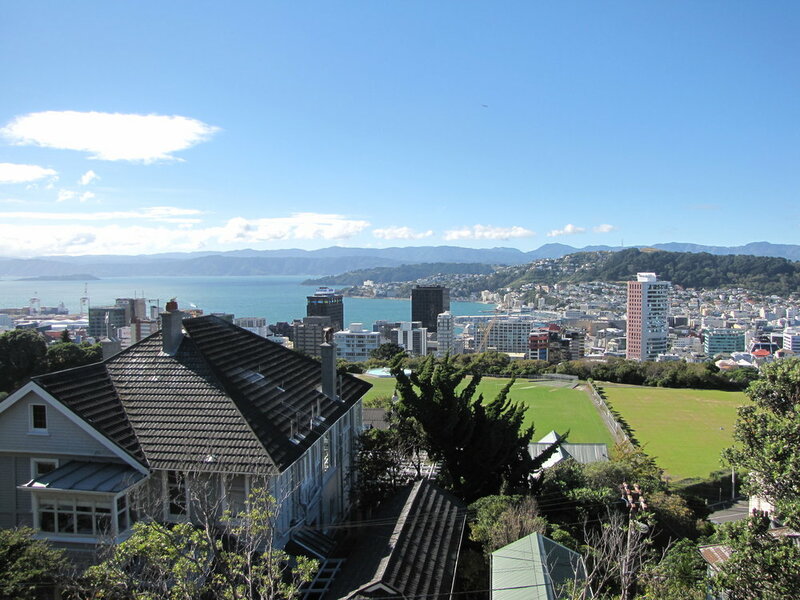 From Picton, we were blown across the Cook Strait into New Zealand’s capital city ... windy, windy Wellington. It’s a delightful city known for the Beehive, TePapa and fine pubs. We tried them all. The Beehive ... New Zealand's Parliament building. Wellington's world class museum, Te Papa. 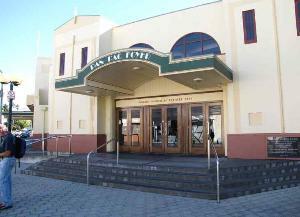 Up the east coast of New Zealand, we stopped in the Art Deco city of Napier and again in Gisborne. Unfortunately, several of our photos were on CDs which were somehow lost. Thank goodness for our old website where we recovered some photos. Though low-res, they're better than no pics at all. 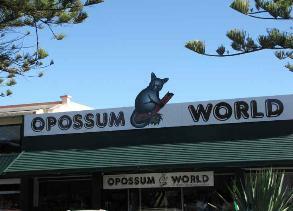 We got a hoot out of Opossum World and ALL things possum! 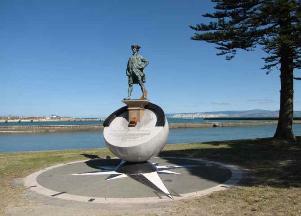 Tribute to Captain Cook's first steps ashore in New Zealand. As usual, we were running out of the sailing season as we made our way north around notorious East Cape and headed back to Opua. Our plan was to leave for Fiji, and in fact we had already checked out, but family issues back in the USA delayed our departure and thus, we happily spent another year in New Zealand. Tough duty!